I’ve just completed a great opportunity by being involved with the Centenary Project and Dietitians Association of Australia (DAA) by providing my “Quick Draw” services capturing thoughts and themes from some of the sessions. This was held at the National Convention Centre as part of the ‘Centenary 100’ Project and involved representatives from all over Australia attending the conference over 3 days – I had a ball and ended up filling 16 A2 pages over 6-7 hours (3 x 2hr morning sessions) – so I earnt my dough! Lots of great exposure and a great experience in what I hope is many more to come………..I’ll keep you posted! Online Workshop For Schools In the Riverina! In partnership with Riverina Regional Library Service, I’m lucky enough to be running an 8 week online cartooning workshop for schools in that region. We’ll be doing lots of fun stuff creating a cartoon character and learning a few tricks of the trade along the way! We also have an interactive blog with videos each week as part of the workshops. Stay tuned as I update everyone with more workshop info! 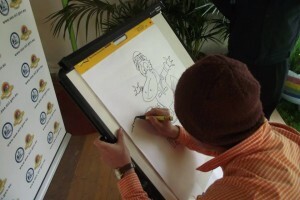 Cartooning workshops facilitated by me are available to all community or government organisations and individuals. My new website will provide further insight to my service which includes mixing education with humour! Lots of different programs are available, including the ‘Quick Draw’ program – “live” drawing as people talk – a great way to prompt information sharing. Keep an eye out for my new website coming soon! I was fortunate enough to be interviewed on community radio regarding my workshops, including the “Quick Draw” program, and what they offer as a community service. It was a lot of fun and a great opportunity to spread the word, so thank you Chaylee! Also, keep an eye out for my eye catching new website with a calendar displaying future programs, and perhaps where you would like me to facilitate a workshop for you? Victor will be back in time for the new season – stay posted! I’ll be facilitating some fun cartooning workshops during the school holidays at Museum Of Australian Democracy (MOAD) over 2 weeks in January (7th – 14th & 17th – 21st ). It’s part of the ‘Behind the Lines’ exhibition where kids will learn how to draw some of our most well known politicians – can’t wait! I’ll also be at the National Museum of Australia for 2 workshops where we bring some of the new exhibition to life – should also be a lot of fun!